On each of the 20 tracks, the groove is separated into 3 melodic ideas. Each melodic idea (example or riff) is played first, by the violin with the groove, followed by just the rhythm section groove, without the violin. The 1st example is usually the easiest, the 2nd slightly harder and the 3rd the most difficult. 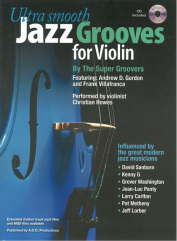 The Super Groovers were very fortunate to have violinist extraordinaire Christian Howes perform and record the violin examples in the book.